The doctor will ask about your symptoms, physical activity, and how the injury occurred. An examination of the injured area will be done. Tests may include x-rays. They use radiation to take a picture of structures inside the body, especially bones. The doctor may prescribe pain medication. Your doctor will order more x-rays while the bone heals to ensure that the bones have not shifted position. When your doctor decides you are ready, start range-of-motion and strengthening exercises. You may be referred to a physical therapist to help you with these exercises. 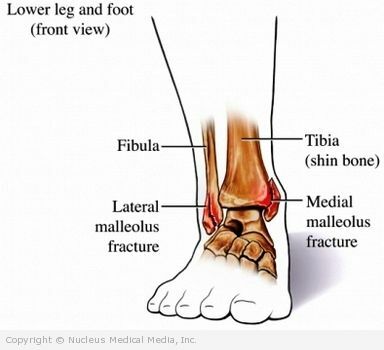 Do not return to sports activity until the doctor says your ankle is fully healed and you have near normal motion and muscle strength.